It sounds like Alison had a decent day today. She was pretty emotional at times, but that's to be expected. But we had plenty of our usual laughs as well. So, overall, it wasn't a bad day. Her dad and step mom arrived in Lincoln to find her in pretty good spirits. They were telling me this evening about going down to the fish tank and naming a certain fish, Chris, because it had puckered up lips. Over the phone this evening, Alison thought that was very funny. : ) But I did make it back to KC tonight in time to make it to our home church for the first time since all of this happened. It was great to be there, but bittersweet too not having Alison with me. I'm hopeful we'll be back together there before long. I heard a good report from our friend, Beth, who organized our first Hope for Alison fundraiser in Pittsburg, KS, today. She said the turnout was really good. And she had some good stories to share about people showing up that didn't even know us, but read our story in the paper and came down to donate. : ) It was really pretty touching. Thank you all so much for attending or helping in any way you did. 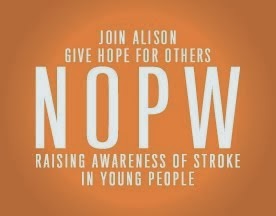 This coming week we're excited to see how Alison progresses with her communication. She'll be exposed to some new technologies that might make it easier for her, so that should be exciting. Thanks again for all you continue to do to support us. All of the incredible love and support we've been shown has really been the silver lining to this entire situation. We can't thank you enough.